I’ve so enjoyed Jennifer at Ellison Lane’s Studio Spotlight series. 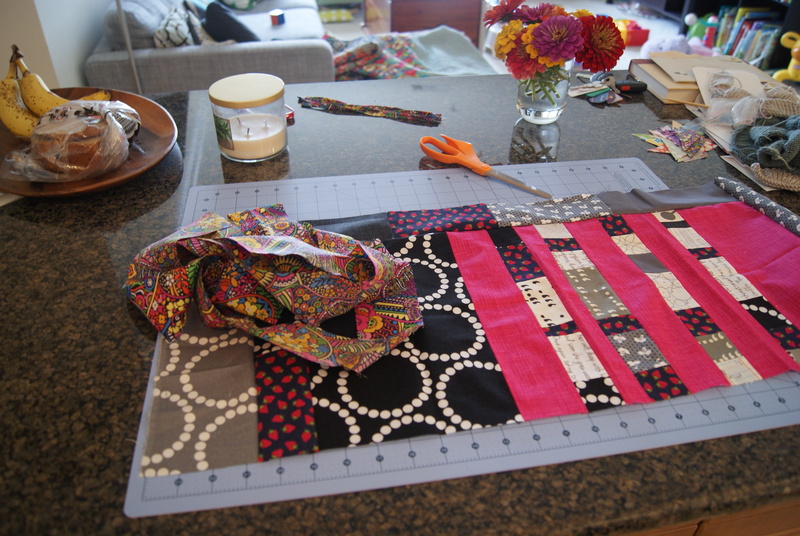 It’s wonderful to see the studio spaces of quilters I admire–I find their spaces as inspiring as I find their quilts! However. It’s time to get real. This, friends, is what I see while I sew on THE VERY BEST of days. The days when we have bread and bananas, the days after our five-year wedding anniversaries when we have zinnias (to conveniently hide the toddler pot). 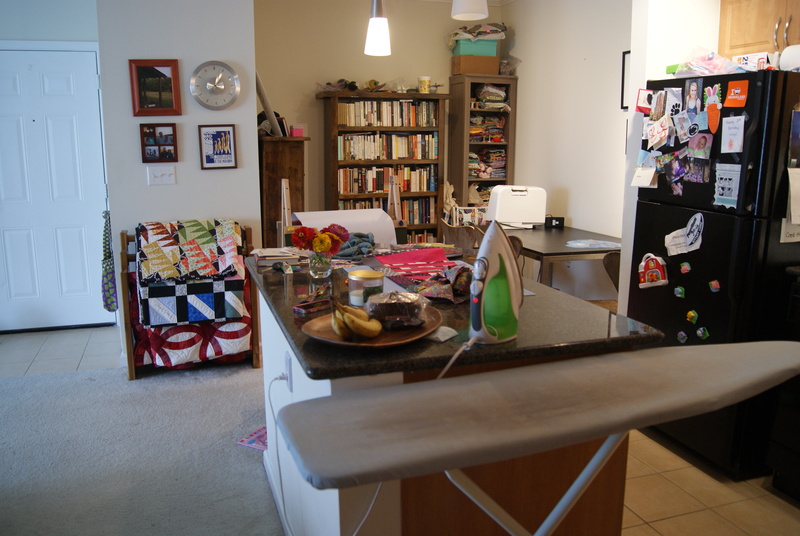 Here is my kitchen island, on a fairly clean sewing day. That’s it! That’s my space! See the Janome? The filthy ironing board cover? I *did* treat myself to a new cutting mat recently, that was a major improvement. 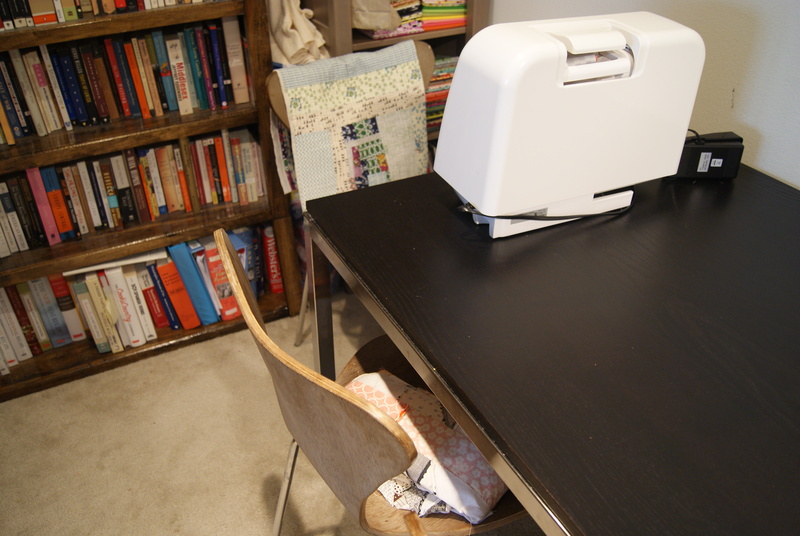 My sewing machine perches permanently at the very end of our (small Ikea) dining table. WIPs get draped over chairs. In the corner furthest from natural light in our matchbox apartment, my stash. (And a yo-yo clown doll that my aunt made for Lucy, that Lucy has since destroyed and I need to re-string.) I moved my stash out of the bin after getting rid of 200ish books. That’s right. It’s like pouring out your Jack Daniels to better store your cartons of cigarettes. Or something like that. In case you didn’t catch it, I have WIPs piled up literally to the crown molding. In this small a space, you learn to use every bit of vertical storage space. I am really happy with the quilts I’m turning out lately. I think I’m doing good work, and I’m proud and satisfied. AND YOU KNOW WHAT? I’m doing that good work in this really teeny, imperfect, messy space. And basting on grubby carpet. I’m here to tell you that’s OK! You don’t have to have an impeccable studio space, filled with gorgeous light and fabric. You just have to DO, and sew, and make quilts you are happy with. No matter the space you’re in. Linking up with Ellison Lane’s Studio Spotlight Link Up, which is open until August 23! 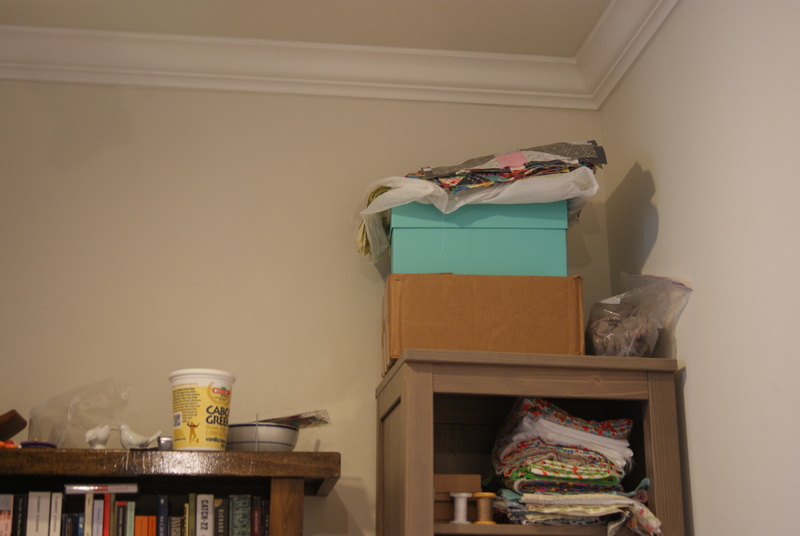 I just moved into a new home with a larger sewing space (yeah!) but bid adieu to my faux hardwood floors for basting (boo!). I am looking for tips on how to pin baste on dirty carpet, please share! Haha, yep! I live in a small apartment too and basting my quilts is a big production that involves moving furniture. And I think we have exactly the same dirty ironing board! The best sewing space is one where you can be creative and happy doing what you love- wherever it is! My sewing cabinet folds up against a wall in our den and I cut on my dining room table. and I like it that way! I choose not to shut myself away from my family even though I have two spare rooms upstairs. hooray for you for quilting in YOUR space! I think you have done an amazing job making use of your space. My mom sewed in the tiny laundry room when I was little and then when we moved she used her walk in closet which was small for her sewing machine and clothes. I sewed in my dining room until last year, nearly 20 years of quilting without a dedicated space. Now that I have a dedicated room, I am plotting for a larger space! I have my eye on my hubby’s 1200 square foot workshop (shhh, don’t tell). Hang in there and be patient, it will happen is my advice. Thanks for being brave enough to share. Fabulous Laura! Thanks for inviting us to your sewing space. It warms my heart. I so love your post it is so important to do and I just need a little more of the doing. Thank you. Can I blow your dirty carpet pin-basting mind? Just a little? Baste on a table top. I think that it doesn’t really matter where we sew. Sewing makes us happy. Creating is just in us and so we will get it done no matter what. You are making awesome quilts and inspiring those around you too! I’ve doe my share of tiny-apartment-with-roommates sewing. The finished product is always worth being cramped. And it’s worth being able to sew in the same place Lucy plays! Or I bet you wouldn’t be nearly as productive! 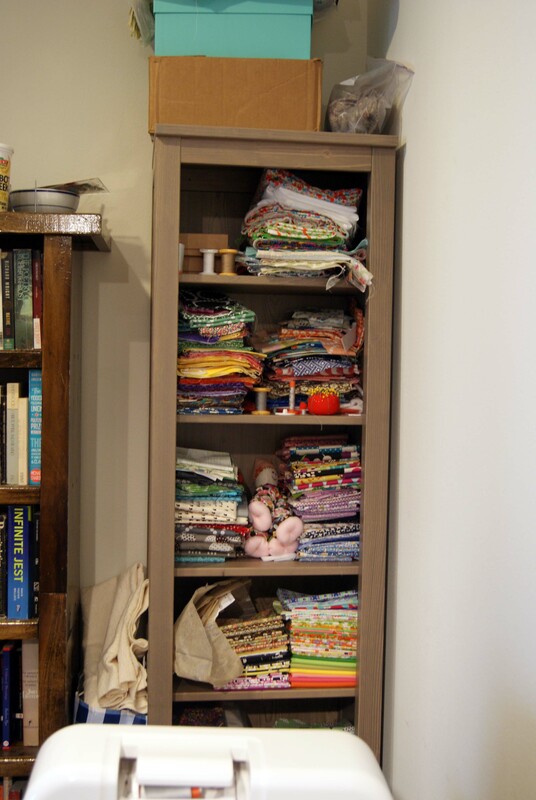 Love this post – I am no stranger to teeny tiny sewing space myself and having to work in a confined area makes you appreciate that your work space does not define your ability. I am in awe of the quilts you’ve been making, so keep on rocking that kitchen island!! Love it! I did the same thing in our tiny apartment before we bought a house. Of course, the only space for me to have any room is in the basement, with no natural light and no wall or floor space. Sometimes you just have to make do with the space you got! I loved this post, Laura. Your home looks happy and real, like you. Thanks for keepin it real! And while i don’t have to baste on carpet, i do have to deal with toys strewn all over, mass amounts of dog fur from our boxer and i’m pretty sure that neither of my boys has ever managed to eat something in there without spilling. So at least when i need to baste my floor gets washed! I’m all for making due with the space you have! You would cry if i posted mine. My sewing machine sits on a table only a few inches bigger then the traveling case it’s stuck in. My stash fits in a tote bag and 2 large plastic food tins. My WIPs are in tote bags and go places with me to be quilted while I wait, otherwise I have no room for them. My totebags are hidden between the couch and a bookcase. I also have the dirty rug to baste on so we use these large tables in the activity room (apartment complex) and I have to rope my hubby into helping because you can’t tie up the space for too long (you can imagine how easy that is). You crack me up. You do such great work with the space you have, I can’t wait to see what you do when you have your own space. I have to confess, I have a space and I still drape WIPs over my sewing chair. If I can’t see them, I forget about them. Fantastic! I quilt at our Ikea dining table too, but have all my supplies in another room. Was great recently to buy a wheely drawer unit! Maybe I should take a leaf from your book and get rid of some books? Don’t know if I have it in me…? I live in a house and have a small space available to me for all of my crafty activity, but it is essentially a storage area. Things are so stacked and messy that I can barely find anything. Actually there is barely enough uncluttered floor space to find a spot to stand while I am searching for stuff, so yeah, I’m a dining room sewer (sew-er). When my sewing machine is not on the dining table, it is placed right next to the table on top of a small bookcase, along with all my other sewing necessities. My WIPs, when they are not on the dining room table, are somewhere in that crazy mess that is my craft room, or stacked neatly on a rocking chair in the lounge room (except when one of the kids decide to rock the rocking chair for no good reason, then they are scattered around the lounge room floor). Your Jonome looks a bit like mine? What model do you have? I’m loving this! It looks like life 🙂 I have batting stuffed between two bookcases just like that! oh, my goodness, GOOD FOR YOU! for making the best of that space you have and for sharing it loud, proud, and real. =) been there in that tiny apartment with a whole corner of my living room a scrapbook space right next to the toddler toys. keep up the good work. small apartment living is character building! somehow I don’t think your quilts are going to get any better even if you do get that lovely dream studio because they are already through-the-roof awesome! Whooot! So glad you shared. I sewed from our kitchen table for years. Totally works! I am hands down impressed that you baste on carpet. You deserve a medal! You know the adage: that which doesn’t kill you makes you stronger? Many of us who do have a light filled, gorgeous studio first stitched onr old machines in dark little corners where children (and cats and dogs and spiders) occasionally hung out. But you do it because it means sanity. You hope and pray for something better, or bigger, or cleaner (believe me with three boys, clean was a goal) and one day, viola! you have it, and it’s even more wonderful because you worked so hard and prayed for so long. You’ll get there, too, just give yourself time.